The World Wrestling Entertainment (Federation) has been a part of my life for as long as I can remember, which I’m sure some of you know based on some of my prior reviews and previews. I still remember watching Wrestlemania 9 live on Pay Per View with my dad, nearly 25 years ago, from Caesar’s Palace in Las Vegas. While I’m sure I watched events and shows prior to that, Wrestlemania 9 is a memory I hold close to me and has become something special. From that point in 1993, I’ve been a fan of the WWF/E, and a loyal one at that. When WCW started to rise up (and steal all the WWF/E talent), I stuck with the WWF/E. All along the way playing every and any wrestling video game that saw the light of day, some were great (WWF No Mercy, WWF War Zone, WCW/NWO Revenge) and some were horrendous (WWE Crush Hour, Simpsons Wrestling, WCW Backstage Assault). 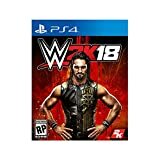 Now here we are with 2K’s annual WWE release, and as I said in my review for last year’s game I expected a lot to come from 2K18 based on 2K17 being very average. Sadly, all of my love for WWE can’t save how I feel about WWE 2K18. I feel it was important to mention my history with the company and wrestling games in general, because I want you to see just how much I wished that this game would be better than it is and how we deserve better. This may read like a beat up session and I’m sorry for that, but I love wrestling and year after year I give 2K the benefit of the doubt since they’ve taken over from THQ and I just can’t do it anymore. WWE 2K18 broke my jabroni back and it’s time to humble them. Last year with WWE 2K17, I gave 2K a lot of leeway as I expected them to be already hard at work on 2K18; I was wrong to do that. For the second year in a row, there isn’t a Showcase mode. Showcase mode had been a staple for the series in the past four to five years and was one of my favorite modes to jump into each year. Playing through the career of Steve Austin, Wrestlemania’s history, rivalries, the attitude era and more. Showcase was a great mode that really displayed the love the development team had for the WWE. It featured voice overs, video packages, special commentary, special match objectives and I’m sure I’m forgetting other things. As a die hard WWE fan, you got to relive classic memories and moments and be a part of them. So with 2K17, I figured the team maybe didn’t have enough time to put in the effort on a whole Showcase mode, due to release date or maybe getting talent for voice overs, whatever it might be. I was wrong, it seems. Here we are with the release of WWE 2K18 and yet again no Showcase mode, so it looks like I was a damn fool. Not only isn’t there a Showcase mode but there isn’t any mode that could be considered as a replacement for it. Sure we still have Universe mode (which is extremely similar to previous years) and we have a My Career/Road to Glory mode, but neither of these two modes come close to what previous games had within their Showcase mode. There isn’t any single player mode that taps that WWE history or passion and that’s just the tip of the iceberg when it comes to WWE 2K18. Let’s jump into some match options that are NEW to this year’s release. We finally have 8-man matches! So now you can have Royal Rumble matches with up to 8 wrestlers in the ring at once. I feel like the consoles have had the capability to do this for years (since it was available on the Dreamcast and PS2 for older WWE titles), but I’m still really excited that we finally have the option for 8-man matches. Before I continue with 8-man matches, I do want to say that the Royal Rumble mode, which is a favorite to play solo and with friends, is great this year. They improved the mini games within the match, eliminations can come a bit easier for you and for the AI and the match can get more hectic than it could previously with the 6 person limit. Now for the 8-man match I’ve been dreaming about playing in a game since I was a kid; Survivor Series! (or 8-man tag as it’s listed). This match has a huge bug that makes the mode practically unplayable. I’ve tested this multiple times and while I’m sure it can be fixed with a patch, it hadn’t been fixed days after release and that’s unacceptable for a $60+ game, especially when it’s something that should have been one of the first things tested. What could this bug possibly be you ask? Well the referee in this match decides about nine out of ten times that I attempt to pin my opponent, to take a coffee break and not count the pinfall. Yep, a referee in a wrestling game, the person who controls the outcome of the match, just stands there as the wrestler awkwardly make a pin attempt and waits and waits and waits. Needless to say if you want to play this match to completion you’re in for a lot of frustration and major slowdown. I forgot to mention the slowdown that’s involved when there’s 8 wrestlers on the screen. At points it seems like the match is going in slow motion or in a laggy online matchup. I like that 2K took the initiative to add the 8-man matches (at least they added SOMETHING) but the engine clearly can’t handle all the wrestlers on the screen at the same time. This mode needed more time in the proverbial NXT oven. Hopefully future patches can fix this, but again that isn’t an excuse to release a full priced game thats broken at launch and say “ahh we’ll fix that later.” Let me mention something positive about 2K18 before this gets away from me and I turn into the Angry Videogame Nerd. The roster for WWE 2K18 is great, every year it gets larger and larger. I do wish they kept everyone from previous years, but regardless, this roster is full with almost everyone you would expect (they won’t let me walk with Elias though, until the DLC comes out down the road). One last bit I want to talk about is the in game audio, specifically the commentary. They decided to add Byron Saxton and Corey Graves, which made me think they would record all new sessions with Michael Cole, Graves and Saxton. The finished result comes off like all three recorded their dialogues separately, not only that, but Michael Cole’s lines appear at times to be lifted from previous 2K games. Based off other 2K sports franchises currently and in the past, I expect so much more when it comes to commentary. 2K used to be the leader in how to do sports game commentary and this is just another thing that feels worse year over year. While I’m at it, when am I going to be able to use custom music for my created wrestlers? Last gen consoles let you do it, but we have yet to see this feature available on current gen systems. This review really really hurt me to write. I’ve loved the WWE for most of my life and I wanted this game to be good, but it just isn’t. I feel like I did a real Montreal Screwjob on it and I didn’t even mention the game breaking glitches that everyone seems to be encountering while playing. These aren’t limited to the 8-man tag matches that I mentioned earlier, that was just one specific example that happens all the time in those matches. 2K needs to take a step back and maybe relive some moments on the WWE Network (only $9.99). The passion is gone from this franchise and something needs to be done to get it back. The good thing is, like many other die hard wrestling fans, I’m very forgiving and this year’s “enhancement talent”-like performance won’t deter me from checking out next year’s release. But unfortunately, I can’t recommend this year’s release to anyone. Stick with the older games in the series for now.